Google affiliate Waymo will purchase up to 62,000 additional Chrysler Pacifica Hybrid minivans from FCA US starting later this year to begin a national expansion of the company's public driverless ride-hailing fleet, the two companies said Thursday. In addition, Waymo and FCA said the two companies are beginning discussions with FCA about potentially licensing Waymo's autonomous operations technology for use in a future FCA vehicle that would be available to retail customers. The partnership is an exponential expansion of the relationship between Waymo and FCA, which began in May 2016 with the purchase of 100 Pacifica hybrid minivans for use in Waymo's test fleet. To date, FCA has delivered 600 of the minivans to Waymo. It is unclear how quickly Waymo will take delivery of the additional minivans, but the company indicated that the sales from FCA will be as needed as the Waymo expands operations. Waymo said it plans to launch the "world's first self-driving transportation service" later this year in Phoenix, with a planned expansion later to the San Francisco Bay area and beyond. The service will allow the public to request a driverless vehicle using Waymo's app, similar to human-driven ride-hailing services. For FCA, the partnership with Waymo allows the automaker to receive the technological benefit of advanced self-driving technologies without the high costs of development or the embarrassing public failures that have plagued some other automakers. The announcement comes on the eve of FCA's latest five-year business plan, which is to be presented Friday in Balocco, Italy. "FCA is committed to bringing self-driving technology to our customers in a manner that is safe, efficient and realistic," FCA CEO Sergio Marchionne said in a written statement. "Strategic partnerships, such as the one we have with Waymo, will help to drive innovative technology to the forefront." For Waymo, the Pacifica Hybrid's large size, advanced technology and economical operation have proven beneficial for the development of their planned ride-sharing service. 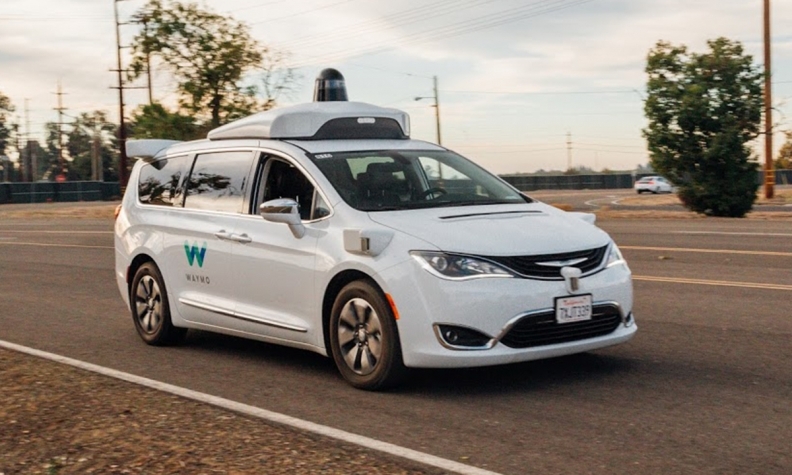 Waymo augments the Pacifica Hybrid minivans' existing sensors with a large roof-mounted hardware and software system to operate without a driver. The two companies say they have worked together to evolve the Pacifica Hybrid to meet Waymo's needs. "Waymo's goal from day one has been to build the world's most experienced driver and give people access to self-driving technology that will make our roads safer," Waymo CEO John Krafcik, said in a statement. "We're excited to deepen our relationship with FCA that will support the launch of our driverless service, and explore future products that support Waymo's mission." Waymo has previously announced plans to purchase up to 20,000 Jaguar I-Pace crossovers to augment its driverless fleet. The company has been developing its self-driving technology since 2009, including more than 6 million miles operated on public roads and 5 billion miles of simulations, Waymo said. Waymo has said it has four pillars in its business plan to commercialize its self-driving technology: ride hailing, licensing its technology, logistics and public transit. FCA does not break out Pacifica Hybrid sales from those of the gasoline-powered minivan, but through April, overall Pacifica sales are up 21 percent to 42,759. However, sales of the more expensive Pacifica still trail those of the older, cheaper and less technologically advanced Dodge Grand Caravan. The Caravan received an unscheduled product intervention with its side-curtain airbags last year to allow it to continue to be sold in the United States past Sept. 1, 2017. Through April, Grand Caravan sales in the U.S. are up 10 percent to 55,024.